Most people tend to walk through the foyer of Rocky Mountain PBS without giving much thought to the history that is in that room. Let me give you a reason to pause next time you step foot in the foyer . . .
KRMA-TV moved to its current location of 1089 Bannock Street in 1992 due to the extremely successful multi-year Legacy Campaign. With the moneys raised, Channel Six was able to purchase and remodel the entire building as well as install a beautiful new Master Control plus add new computer systems, satellites, transmitter and antenna upgrades. 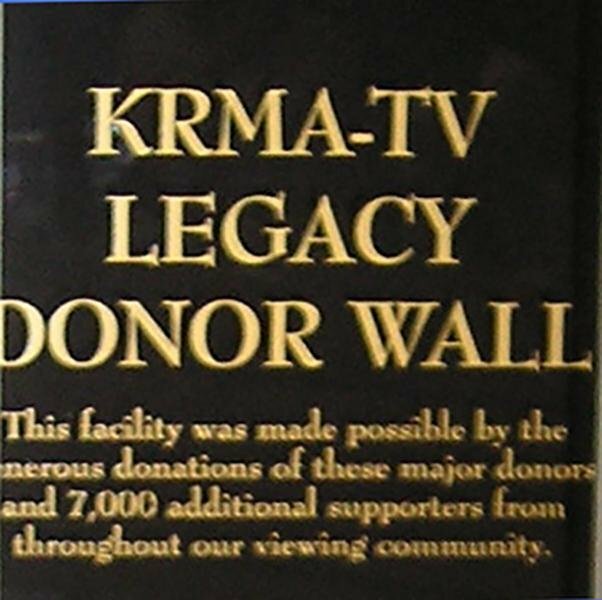 The Legacy Campaign was so successful that KRMA-TV wanted to publicly thank its staff, donors and the 7,000 additional supporters from throughout its viewing community who contributed to the station’s legacy campaign. Twenty years ago this month . 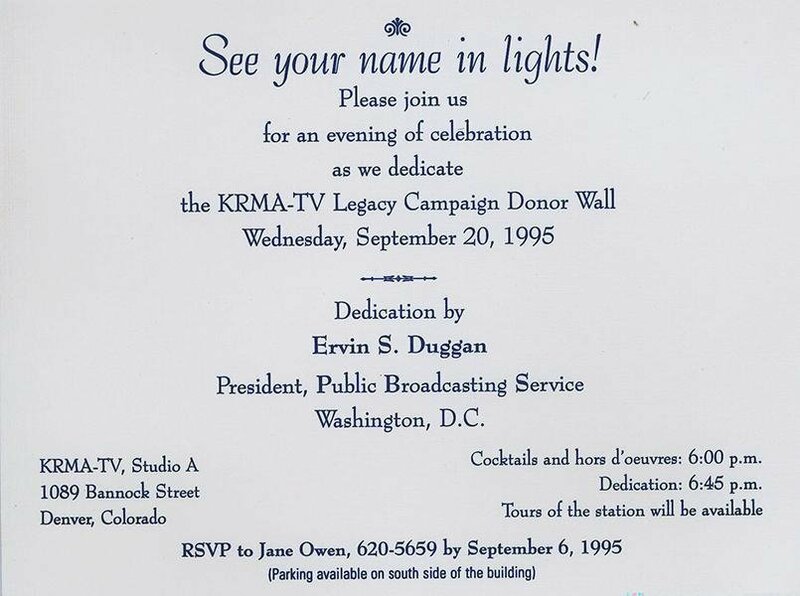 . . Ervin Duggan, the 4th President of PBS, was the keynote speaker at the September 20, 1995 dedication and celebration of the KRMA Legacy Campaign Donor Wall. Mr. Duggan delivered a very positive and inspirational message regarding both PBS and KRMA. Dedicated KRMA volunteers were in abundance to assist at the festivity by greeting guests, serving as parking attendants, caring for guests with special needs and serving as all-around hosts of the celebration. Along with the reception, tours of the new station were offered to all guests that wanted to see the “new home” for KRMA-TV. The donor wall serves as a historic welcome sign to the community that supports Rocky Mountain PBS. 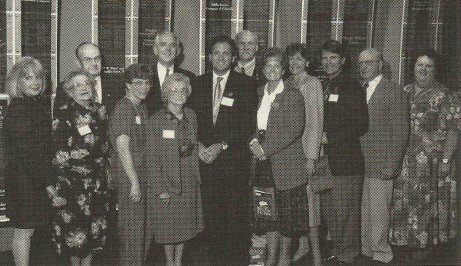 Next time you walk through the lobby of Rocky Mountain PBS, please take a moment to browse the quotations, staff names, and individual and corporate donors that appear on the 1995 Legacy Donor Wall. 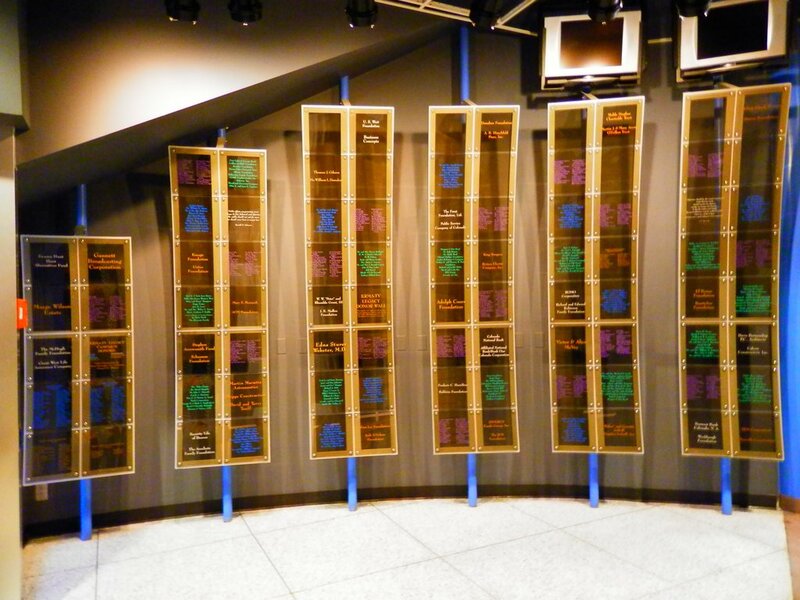 The donor wall is truly an inspiration and a powerful visual statement of the vast support of our public broadcasting viewers and supporters throughout the Rocky Mountain region. Station’s Archived Memories (SAM) serves the past, present, and future of Rocky Mountain PBS by assuring that the history of the station and its importance to the Colorado community will survive for generations to come.